(Kitco News) -Technical factors are the biggest driver for gold, as the market sees little need for safe-haven investments, and that prices have room to move lower in the near-term, according to analysts. A break below the 100-day moving average, around $1,218 an ounce, created some strong selling pressure and pushed gold to a five-week low - testing support just above the key psychological area of $1,200 an ounce. 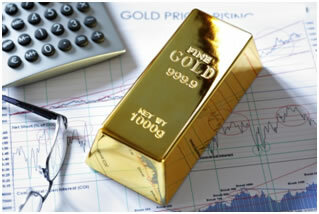 As of 1:38 p.m. EST, Comex April gold futures were trading at $1,207.6 an ounce, down $19.50 or 1.59% on the day. Bill Baruch, senior commodity broker at iiTrader, said the break below $1,218 level created significant momentum for the bears in the marketplace and now he is looking to see if support will hold around $1,199.60. If that breaks, there is a strong possibility that gold falls back to the $1,130 area in the medium term. Baruch added that he is surprised that gold was not able to hold near-term support as uncertainty over Greece exiting the eurozone and continued conflict in the Ukraine should create some safe-haven demand for the yellow metal. Michael Boutros, currency strategist at DailyFx, said he has been bearish on gold since last week as the market broke below the $1,251 to $1,248 area. He added the current momentum could continue to push prices the $1,195 region. “I think we will get another drop and we will see if we can hold that area,” he said. “If we can’t bounce off the $1,200 back up to $1,248, then I think we could head back to $1,171 and eventually last year’s lows. Sean Lusk, director of commercial hedging with Walsh Trading, said that with the physical buying period now over, there is a good chance prices continue to trend lower. He added that money continues to flow into the U.S. dollar and equity markets. Although there is room to move lower on the downside, Lusk said that he would expect any drop to $1,180 area will be bought back “with a vengeance.” But looking at historical trends, that might not happen until the second half of the year. “We are entering a slower time for the gold market, so we could see prices trend lower and consolidate for a while,” he said. Mark Leibovit, editor of the VR Gold Letter, said that he would not recommend chasing gold prices lower as the fundamental picture continues to support gold prices. However, he added that it is not the time to buy on a dip. Gold Plunges, Heading Toward Key "Line In The Sand"